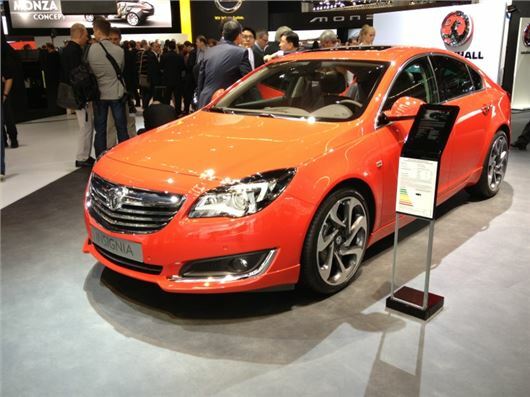 Vauxhall has revealed its facelifted Insignia VXR ahead of its official launch at the Frankfurt Motor Show. One of the fastest new cars on the market, for under £30,000, the 170mph Vauxhall gets a number of cosmetic tweaks to bring it in line with the revised Insignia, which will be launched in the UK in October. The changes are relatively minor, with slightly re-styled bumpers and lights, along with ‘saber-tooth’ detailing to the chrome air intakes and tailpipe. The 2.8-litre V6 powerplant remains unchanged, with 325PS and a 0-60mph time of 5.9 seconds for the hatchback and 6.1 seconds in the Sports Tourer. Gearboxes remain the same too, with the option of a six-speed manual or automatic. Revisions have been made to the Insignia’s all-wheel-drive system, to improve the car’s stability, and the ESP software has been updated to improve handling and reduce understeer. Vauxhall’s engineers have also made upgrades to damping, which should improve overall ride quality. Inside, the VXR gets a new instrument panel and a revised central console. Digital radio is now standard across the range and there’s number of options available, including Bluetooth-operated internet connectivity, 8-inch touchscreen and 3D navigation. The order books for the Insignia VXR SuperSport now open and prices start at £29,749 for the hatch and £31,049 for the Sports Tourer.